Chemical bonding deals with the study of formation of compounds out of elemental forms of atoms. Various forms of bonding may be classified into the following types. The best ionic bonding can be seen in the combination of non-metals, alkali and alkaline-earth metals. In molecular formation, like charges gets repulsed and those being oppositely charged, gets attracted in which each positive ion is surrounded by negative ions in attraction forming a net zero balance of ions for the stable ionic compound. The ionic bonds are also referred as extreme form of covalent bond, which happens only during a great difference in electronegativity of the participating atoms. The covalent bonds can also be formed other than in organic compounds. Inorganic substances like water, chlorine, ammonia, nitrogen and hydrogen also exhibit covalent bonding. 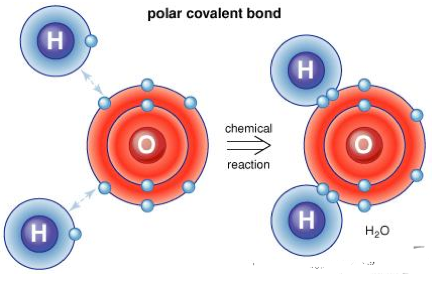 The covalent bonds in the molecules are represented by solid lines and examples are shown below. The single line represents single bond, two lines for double bonds, three lines for triple bonds which are represented symbolically as . The metallic bonding not being like ionic or covalent bonding, it is formed by the attraction of valence electrons and metal ions. In simple representation, many electrons surrounding the metal ions acts as glue in bond formation termed as metallic bonding. The loosely bound electrons forming a “sea” of floating valence electrons is the characteristic of metallic bonding. This very nature accounts for the highly electrical conductivity to metals. 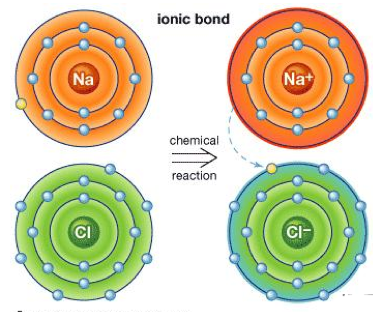 Ionic bonds are formed by complete transfer of valence electrons from one atom to another, between atoms having the greatest difference in their electronegativities. Covalent bonds are formed by sharing of valence electrons, between atoms having minimal difference in electronegativities. Metallic bonding occurs between atoms within a metal and has a “sea” of floating electrons on the surface. In the solid state, the ionic, covalent and metallic bonding, all are arranged in definite geometrical shapes which are known as lattices. The measurement of the atoms tendency to attract the bonding pair of electrons are termed as electronegativity and the formal charge among the atoms / molecules represents its resonance state. The tool used to measure electronegativity of the atoms / molecules is the Pauling scale where least electronegative atoms are Caesium and Francium with the value of 0.7 and the most electronegative atom is Fluorine with 4. The polar and non-polar bonding of the molecules are determined using electronegativity values, in polar bonds the one of the molecule is slightly positive and other end of the molecule is slightly positive favouring the dissolution of the molecule where as in non-polar molecules the charge in both the ends are not balanced it exists in uneven distribution results in non-dissolution of the atoms / molecules. The non-polar covalent bond exists when no electronegativity difference occurs. Only a small electronegative difference results in the formation of polar covalent bonds. The ionic bond results from the large electronegative difference. Electronegativity of atoms determines the nature of chemical bond formed between them. Attractive and repulsive forces operating within molecules and ions determine their shapes. Gary L. Miessler and Donald A. Tarr, Inorganic Chemistry (4th Edition).